Ready to start something others have ignored? You’ve come here because you’re curious about how to build a movement, or maybe you just saw one of my Instagram posts. Either way, you’re here now! I want to share one of my tools with you, #firestarter. 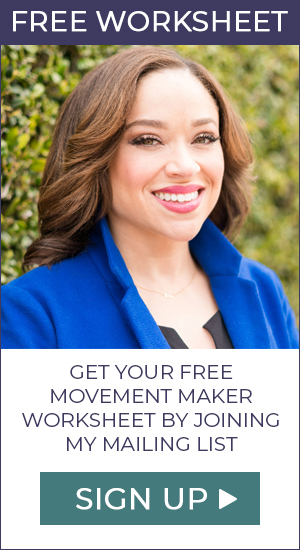 Have you visited my website, signed up for my newsletter, and downloaded your free Movement Map: An Assessment Tool for Movement Makers? Surely you did, so let’s get started. 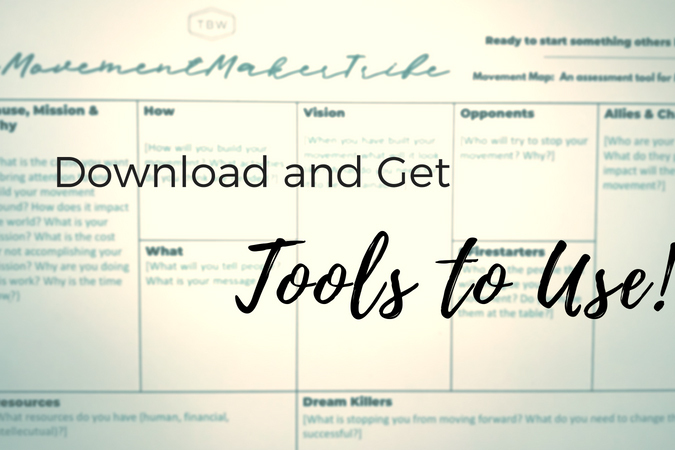 This is an easy to use document or assessment that will help you organize your thoughts and think of the resources you have to start a movement and how you’ll go about doing it. 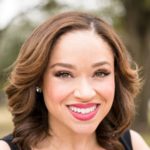 It’s also laid out in a way that you can teach others—it’s something you can bring to a PTA meeting, Junior League project meeting, or community coalition. Cause, Mission, Why? In the first section, you’ll write your cause, mission, and your why. In the book Start With Why, Simon Sinek says, “People don’t buy WHAT you do, they buy WHY you do it.” Think of these as the three most important sentences in the world. They are the way you’ll recruit people to join your movement. Be sure to answer all the other questions in this section because it’ll help you explain what you’re doing to others. How? What? This is pretty straightforward. The how is the tactics and activities you’ll do to grow your movement. The what is communications based. It’s your 30-second elevator pitch about what your movement is and why you’re doing it. This is why the cause, mission, and why are so important. They will help you to develop this message. Vision. Think big and challenge yourself when you write the vision. Do you see 5,000 people at a rally supporting you? Then write it down. If you want to get Reese Witherspoon to be your spokesperson, write that down, too. You have to dream it for it to happen. Don’t forget to take action to make it happen. There’s no movement-maker-jeanie-in-the-bottle around here. Opponents. These are the people that want to stop you from succeeding. They are the haters that say it won’t happen or they disagree with the change you are trying to make. You’ll need to study them to know how to overcome any obstacle they send your way. Firestarters. Of course, we threw #firestarters on the map. Who are the people you want by your side as you further your movement? They might inspire others, they might work on operations or serve as a spokesperson. List them out so you can be sure to ask them for help, as well as have a role for them. Allies & Champions. Everyone needs a friend in the trenches. Who is your vanguard and connector? Your allies will support you and your champions will lead the way. Resources. Most movements take money to get started. What things do you need to get your movement going and have enough people doing the work? You might have access to them or you might have to ask others to help you get them. Dream Killers. Obstacles. Dream killers are the things that might keep you from moving forward. It’s important that you know they are not the only way to make something happen. There’s always, always a way to overcome a dream killer (in my opinion). Now that you know what each section in the movement assessment means, you can put some thought into it. Try it, go ahead and fill it out. This is a living document, meaning you can adjust as you go along. 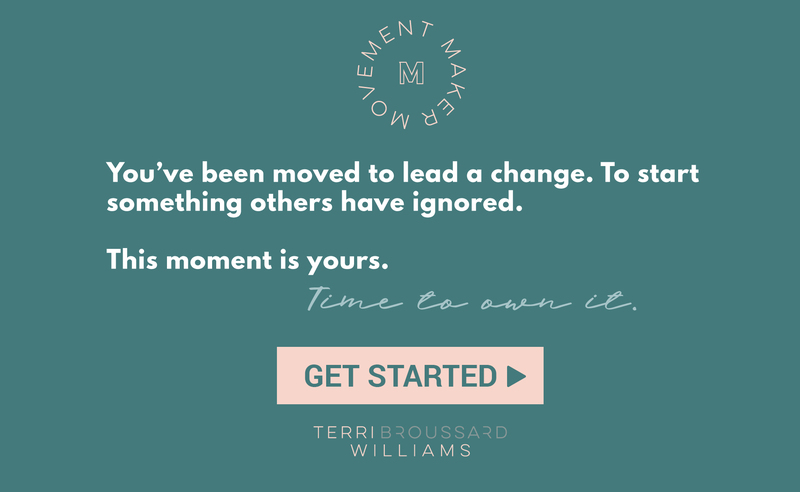 If you need help or a second opinion after you fill it out, email me at Terri@TerriBWilliams.com. I’ll take a look at it and offer you some advice or cheer you along if it’s perfection. Are you unsure of the movement you want to get started? No worries, you can still use the movement assessment to practice! Read this blog article about a movement in Oklahoma and then use it to complete the map. You can always google, “Oklahoma Teacher Pay Raises,” to get more context about their issue. You got this, #firestarter! I have another Simon Sinek quote for you, #firestarter. “If your actions inspire others to dream more, learn more, do more and become more, you are a leader.” That’s why I’m confident that leaders turn moments into movements. I’m also confident that you’re a leader, #firestarter. Don’t forget that it’s your time to own it. Let me know how I can help you win! PS. Don’t forget that you can get regular inspiration at our Facebook home. I would love to hear from you there, too.